You might have noticed that Six Sisters' Stuff is pinning a lot of TodaysTaste.com. The reason is because I am actually one of the sisters! My name is Kristen and I am the second sister. (You can find more about me HERE) My husband and I started this blog because we trying to live a healthy lifestyle. My blog is officially 3 weeks old and I'm going to be completely honest with you. I am Loving Essential Oils. I never thought I would be.... I thought they were a little out there. :) When I was first introduced to Essential Oils... I didn't really get all the hype about it. I tried a little DoTerra but they were expensive and I felt a lot of pressure that I needed to sell them (which I really did not want to do). Then I met a women named Jillee from the blog: One Good Thing By Jillee and her sister Rebecca from the blog Camp Wander and they introduced me to a new brand of oils: Spark Naturals. Please note....I am very new to oils but I am so excited to learn more about them! This blog is going to be my way of learning/experimenting with oils, cooking healthy food, and focusing on being healthy! 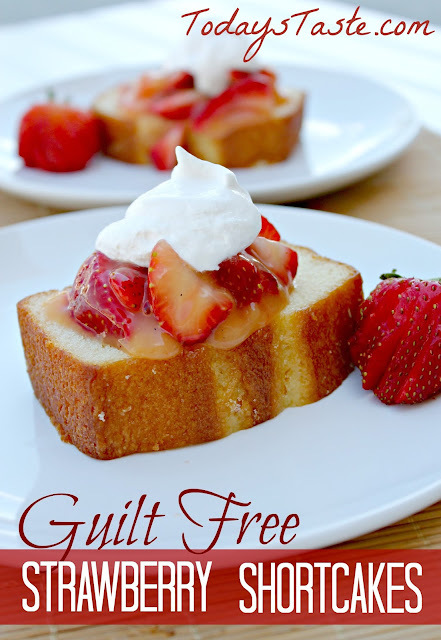 Now on to my Guilt Free Strawberry Shortcakes! I still love a small treat every now and again. This Strawberry Shortcake is about 100 calories and it tastes delicious! I don't feel too bad about eating this, and I don't feel too bad about feeding it to my kids! Stir cornstarch and orange juice in a small pot. Bring to a boil, stirring constantly 1 minute or until mixture is thickened and bubbly. Remove from heat, and stir in vanilla and Lemon Essential Oils. Cool 5 minutes in the refrigerator. To serve, spoon sauce over dessert shells. I added 1 Tablespoon of Fat Free Cool Whip, but it tastes awesome without it also! Use the code "Taste" for 10% Off Your Entire Order! Hooray! Congrats on your new purchases! I just ordered more myself. :) Thanks for your comment!